Comparisons are inevitable whenever the offspring of a famous musician tries their own hand at becoming a pop star, so it’s admirable in and of itself that the likes of a Julian Lennon or Jakob Dylan Rosanne Cash or would even open themselves up to that kind of oft-vicious scrutiny just for the sake of expressing themselves creatively. And suffice to say when your parents are the authors of such seminal pop standards as the Shirelles’ “Will You Love Me Tomorrow,” Little Eva’s “The Loco-Motion,” Steve Lawrence’s “Go Away Little Girl,” the Monkees’ “Pleasant Valley Sunday,” the Chiffons’ “One Fine Day,” Bobby Vee’s “Take Good Care of My Baby,” the Drifters’ “Up on the Roof,” and Aretha Franklin’s “(You Make Me Feel Like) A Natural Woman,” expectations are bound to be a little unrealistic. 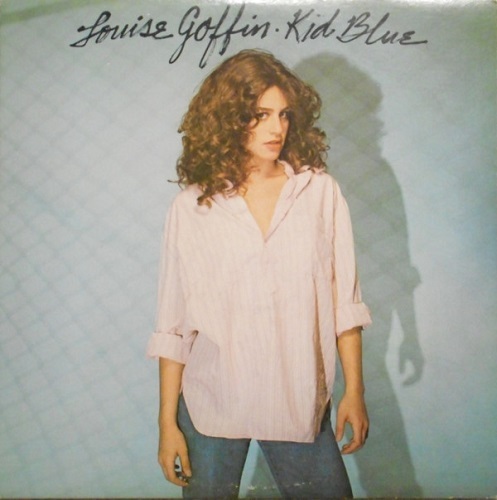 But while you may not have heard of the name Louise Goffin and her commercial success pales to that of even her former babysitter (Little Eva, who’d score three additional Top 40 hits following the chart-topping success of “The Loco-Motion” before fading from prominence), the daughter of songwriting legends Gerry Goffin and Carole King (who’d sadly divorce in 1969) still managed to build a fairly interesting, if not especially well-known, musical resume for herself. Louise’s biggest brush with chart success actually arrived fairly early in her life, when, at the age of only fourteen, she (along with younger sister Sherry) was brought in by her famous mother to sing backing vocals on the lovely Wrap Around Joy cut “Nightingale,” which would be released as a follow-up single to “Jazzman” and both hit the Top Ten and top the adult-contemporary charts. Unfortunately, Carole’s string of hits would dry up shortly after (barring a remake of “One Fine Day,” mother Carole never had another hit after 1977’s “Hard Rock Café”) and the family would move to Idaho except for the still-teenaged Louise, then only seventeen, who remained behind in California to finish up high school and begin a recording career of her own, having inked a deal with Asylum Records, then home to such giants as Jackson Browne, Eagles, Joni Mitchell, and Linda Ronstadt. Both of her two full-length releases on the label would be overseen by then-boyfriend Danny “Kootch” Kortchmar, who’d famously served as mother Carole’s lead guitarist on all her records for Ode dating back to Writer: Carole King and also doubled as James Taylor’s guitarist during that time. The biggest difference between mother and daughter, however, is that while Carole’s music helped to define the mellow sound of the introspective singer-songwriter pop that revolutionized the industry in the early ‘70s, Louise is much more interested in rocking out, and this is a much harder disc than anything Carole herself has ever made, never more so than on pure pounce of the title track and the delightfully infectious single “Jimmy and the Tough Kids,” which finds Louise ceding piano duties to longtime Peter Frampton sideman Bob Mayo in order to take up electric guitar. [The great Andrew Gold, then also an Asylum recording artist, appears on the cut as well to play synthesizer.] Even mellower cuts like the mid-tempo rock of the Kortchmar co-write “Red Lite Fever” and the gently-groovy “Angels Ain’t for Keeping” still pack a real bite in their lyrics, or, in the case of “Trapeze,” the haunting and ambient production. But perhaps the most fun cut of all for rock music fanatics is the slow piano stomp of “Singing Out Alone,” which boasts one seriously star-studded cast of musicians: Toto’s Steve Lukather and David Paich play guitar and organ, respectively; Peter & Gordon’s Peter Asher provides percussion; while the background vocals are provided by J.D. Souther, Don Henley, and Carole herself! The 1981 self-titled follow-up is nearly just as much fun, opening up with a great new-wave-styled makeover of the Bells’ 1959 hit “I’ve Had It,” and rocks out just as hard, especially on the pounding “Runaway Boy” and the slow swagger of “Dog Town.” [As if to assert her identity as a rocker and further cast aside any comparisons to her mother, Louise – in stark contrast to the multi-instrumentalist prowess exhibited on the prior album – has even left the few piano duties here to session players, sticking exclusively to her guitar.] Like Kid Blue, the disc still has its ballads, but they’re seldom overly soft, and “Rockin’ on the Strand” has its share of grit. Carole’s nowhere to be seen this time around, but Louise doesn’t entirely exclude her famous parents: both the waltz-like “Baby, Come ‘Round to Me” and the snappy rock of “Might As Well Pass By” are co-writes with father Gerry! But it’s the mid-tempo acoustic rock of “If You Ever Did Believe” that is undoubtedly the most curiosity-provoking track of all here, having the distinction of being a then-previously-unreleased song from the pen of no less a star than Stevie Nicks, who also provides backing vocals on the song alongside longtime Nicks backing vocalist Sharon Celani. Nicks would eventually record and release her own version of the song for the soundtrack of the Sandra Bullock/Nicole Kidman movie Practical Magic in 1998, but until that time, this disc was the only place where you could find the song. And then, Louise more or less strangely just disappeared for seven years. Barring an excellent contribution to Fast Times at Ridgemont High (the underrated “Uptown Boys,” one of the soundtrack’s more infectious tracks), Goffin wouldn’t be heard from again until 1988’s This Is the Place, having moved to the U.K. in the years since her last album. [Following one last major-label outing in 2002’s DreamWorks-issued Sometimes a Circle, Goffin would go the indie route and form her own imprint, Majority of One, through which she’s issued five more discs to date.] But though her solo records have attracted only minor attention in the U.S., she’s still much-respected in the industry and served a stint in the late ‘90s as a touring guitarist for Tears for Fears. Much more famously, she’d sing alongside her famous mother on the new recording of the Tapestry classic “Where You Lead” that served as the theme song to the wildly popular TV drama Gilmore Girls.